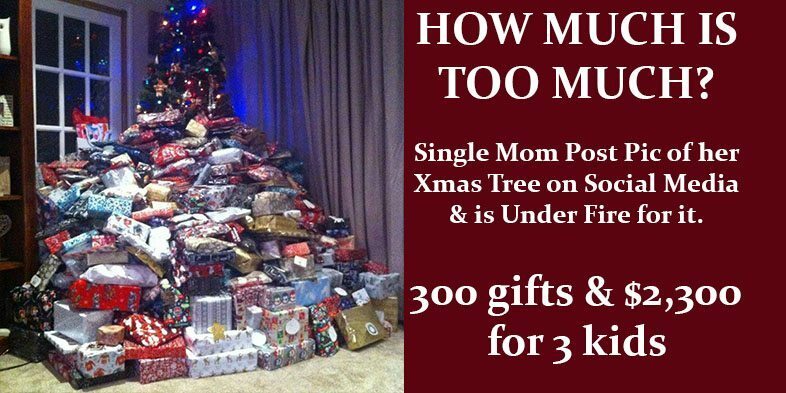 Single Mom Buys $2,300 Worth of X-mas Gifts for Her 3 Children & Is Under Fire | How Much is Too Much? The Christmas season brings out the ridiculous in many people around the world. There is no denying this when there is evidence all over social media of people posting their purchases with the pride that makes the creators of materialism smile with pride and joy, not to mention the corporations that are going to grow their riches. Nevertheless, despite the calls for boycotting Christmas spending throughout the world, many are flocking to the stores to make purchases of goods and services they don’t really need. This British woman from the photo proves just that with her purchase for her three children. The woman has been identified as Emma Tapping by WILX News 10 on their Facebook page for discussion. However, she does have three children ages 13, 9 and 19 months. The image contains over 300 gifts she purchase for them, totaling just over $2,300, which many people feel like she did a good job spreading it out and buying a lot of gifts. The woman defends her purchases by saying she works hard all year round and loves to spoil her children on Christmas. It is one of the reasons she works so hard during the year, so she can show out on this one special, materialistic day. The responses have been mixed. Many people support the woman’s efforts to “show her children she loves them”. Others believe this is downright ridiculous and part of the problem with western culture, spoiling children and creating adults with a since of entitlement instead of a work ethic. Personally, I believe this to be downright ridiculous, but that’s just my opinion. No child needs half of this junk and they won’t even touch most of it after three weeks…if they last that long…but that’s my opinion. Allow me to toss another wrinkle in the equation before you chime in…. What if this were a single black mother? The woman is actually from Britian, so the likihood of her being black isn’t much. However, what if she was an American black woman living on the southside of Chicago? Would your response be the same as you are about to make or would you be more judgemental of a single, black woman making these purchases?